Running stitch is also known as quilting stitch and Darning stitch. The same hand motion is used to make all three, although there are differences in the spacing of the stitches. Quilting stitch is usually worked with spacing are of the same length and many quilters work very hard at creating evenly spaced stitches. To work this stitch simply pass the needle over and under the fabric in a regular even manner. Pattern darning creates very attractive designs by changing the length of the stitches and the spacing between them. This simple but versatile technique has a long and interesting history tracing back to Mamluk Egyptian embroidery where pieces have been discovered that date back to the twelfth century. Iceland too has long tradition of creating patterns with this simple stitch. Japan has Kogin work, which is also a form of pattern darning and based on running stitch. Kogin is closely related to Sashiko, a form of quilting. My point is that running stitch is truly an international stitch, with a long and interesting history and I don’t think its life is over either as all of these techniques are still avidly practiced. 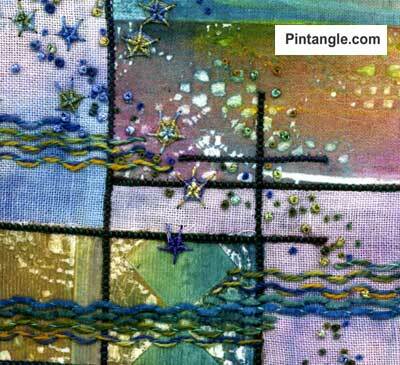 You can use Running stitch to create simple outlines many contemporary art quilters use it to create lines and is frequently seen in contemporary ‘primitive’ styles. Running stitch is also often the foundation now, for many more complex stitches. 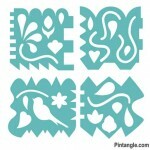 No matter what style of embroidery they are all based on the same basic stitch and hand movement. I finished a cover for an altered book in Japanese boro, perfect for Beyond TAST. Thanks so much for running TAST this year! I’m new to the challenge and plan on building the stitches into a holiday table runner that will *hopefully* be ready by next December. Hi, Just joined the group. I am very very new at hand stitching, actually I never liked hand stitching so I am looking forward to learning how to do them after seeing all the beautiful designs. Thank you for allowing me to join this group. I am an avid sewer and machine embroider so this will be a little different for me. I will start working on my design book today. thanks again….. Yes you have th e right spot! Running stitch (with chain, couching and the next 2) are found here. My Running Stitch is posted at my place. I have had a lot of fun working this stitch. i could have kept going with it. These are some my trials for running stitch of TAST. I wasn't able to do something new this week, but I've posted pictures of three mosaic faces that I stitched in running stitch a couple of years ago. It was a big surprise for me to find my attempt on couching among the highlights of last week. Thank you, Sharon, this encourages me very much! Here is my running stitch. This week my TAST sampler is a tribute to my sewing teacher, since Running stitch was the first stitch we were taught. I have also included my mother's needlecase featuring running stitch, worked in 1929 when she was 8 years old. Two special ladies in my life, which is appropriate in International Women's Week. I first thought ho-hum about the running stitch until I started looking around at different samples. Then I played. I am posting my running stitch which had been done twenty years ago.by me. Here is my sample. this is old Russian pattern. http://christinaroland.blogspot.com/2012/03/tast-week-10.html For my entry of week 10. Simple stitch, stunning possibilities! One more couching project and two running stitch pieces, one pattern darning and one random, are up on my blog. Added running stitches to the background of my TAST 2012 piece. Each stitch added makes it more interesting. Thanks, Sharon, for spearheading such a great challenge. I wouldn't be doing this piece without your weekly prodding. Here is one of my many embroideries of Kanta-a traditional Indian embroidery forms which basically uses the running stitch in various combinations. I am submitting two of my works for this week's TAST . though the stitch used here is the darning stitch which is much similar to running stitch, I suppose this would qualify for this week's TAST.